Home » Concrete » Precast & Prestressed » Floor/Roof Systems » Strescore Plank » Building With Strescore? The most common floor and roof elements employed for shorter spans are 205 mm deep untopped Strescore plank. These slabs can span up to 9 m or more without intermediate supports. Longer spans can be achieved by using 254 mm – 12m span or 305 mm deep 13.5m span Strescore Plank. Final Design of the individual plank is usually the Responsibility of Strescon Limited. The planks are designed according to the latest requirements of ACI standard 318 or CSAS standard A23.3, to carry the loads specified in the contract documents. The design of the supporting structure, diaphragm action, lateral loads, bracing, anchorage and stability of the various components is the responsibility of the project engineer. 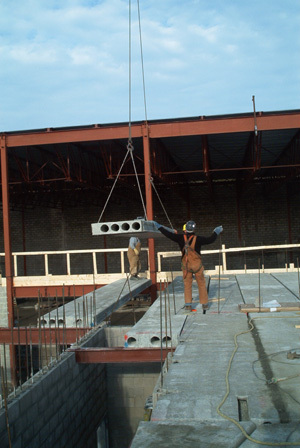 Lateral load transfer can be accomplished by weld plates or grout connections. It should be noted that PCI recommends that prestresses concrete components such as Strescore Plank should not be rigidly connected at both ends. This is to prevent damage to the plank or supporting structure due to creep, shrinkage and temperature change movements which occur in plank. The primary consideration in developing a framing scheme using Strescore Plank is the span length. Please refer to the load tables listed below for recommended spans of the various sizes available. The values given in the tables are for gravity loads only and are intended for preliminary member selection. Separate analysis of the effects of lateral loads caused by wind, earthquake, moving loads, etc. must be carried out. Contact Strescon Limited for further design and detailing information.